We at Melbourne Healthcare Drinks were delighted to invite Mr Glenn Cross, a former CEO of AusBiotech, to present at our last event. 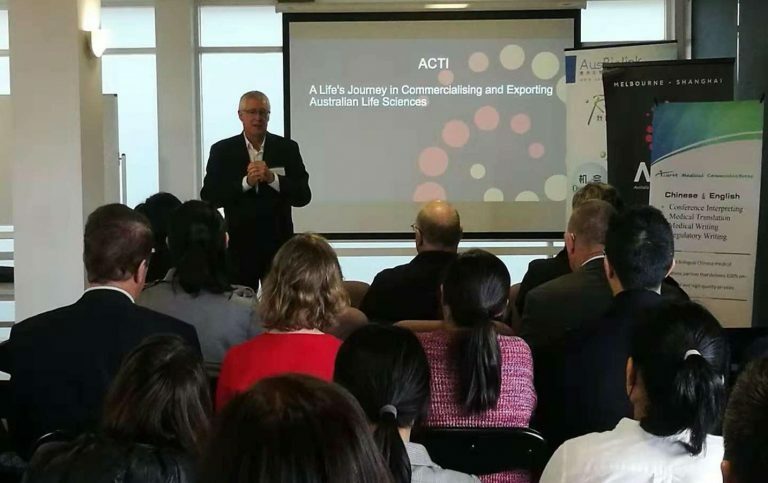 At the event, Glenn talked about the present and the future of commercialising and exporting Australian life sciences. He also shared valuable lessons and tips based on his life-long experience in the sector. Australia medical research has over 100 years of excellence. It is the world’s top 10 in research and top 2 in intellectual property. The sector is proud to have strong government support. 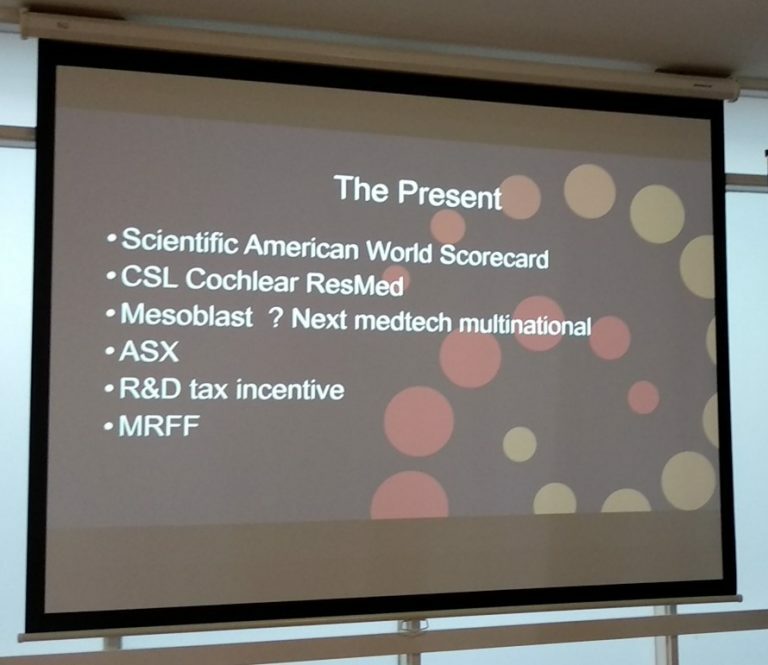 Australia’s global life science companies include CSL, Cochlear and ResMed. Also, Australian Stock Exchange (ASX) is one of the best globally in biomedical sciences. The Research and Development (R&D) tax incentive is the Government’s key mechanism to stimulate the Australian industry’s investment in early-stage commercialisation. By providing a tax offset for certain R&D activities, it encourages companies to engage in R&D conducts. There are different voices, but in Glenn’s opinion, R&D tax incentive must be retained. Medical Research Future Fund (MRFF) is another significant funding resource. The current MRFF has investment from the Government of over 1 billion Australian dollars. In the future, Glenn’s view is that the MRFF must include translational commercialisation funding. Can we utilise some superannuation as a fund? Glenn proposed. Now, we Australians have about 3 trillion in superannuation. If everyone is willing to take out just a small portion to invest in life sciences, it will aid the sector to secure much-needed money. Sadly, the Government has not been willing to do this. Let’s hope for the future! The characteristic of life sciences is we always need money, forever, Glenn commented. It is crucial to know how to talk to investors, in ways that they understand and in ways that convince them to invest. Thus, commercialisation skills should be included in post-graduate courses. From bench to bed, a new drug will take 15¬20 years of hard work. And only 5% of successful drugs at the R&D phase will enter into commercialisation. This alone requires enormous perseverance and grit. For young professionals, it is never too much to stress networking. We are in an era of global business. Grasp every opportunity to network (and, come attend Healthcare Drinks! —Author). Networking is all about collaboration, and together we strive to have win-win for all parties involved. Things change, and they change quickly. Government and business partners make new decisions all the time. While it is essential to have a plan — no plan and you’ll fail — you also need to be flexible to accommodate changes. Not much money is injected into early-stage projects, as they are seen as risky. This is a problem not only in Australia but globally. More Aussie investors are needed in different stages of drug development. In comparison, in China including Hong Kong, the number of investors is growing. Glenn has a passion seeking fund for Australian companies from the US and Asia including China. In the future, the biggest healthcare market will be China. Increase in non-communicable diseases and an ageing population require better and more health care. Immunotherapy in cancer treatment is very hot. Currently, the Chinese government is also keen to bring technology to China. To succeed in China, you need to conduct thorough due diligence and have trusted advisers before further engagement. This is indeed the case for every overseas market. Glenn’s speech finishes with a positive tone. He is optimistic about the future in seeing more funding and better commercialisation programs in Australian life sciences. 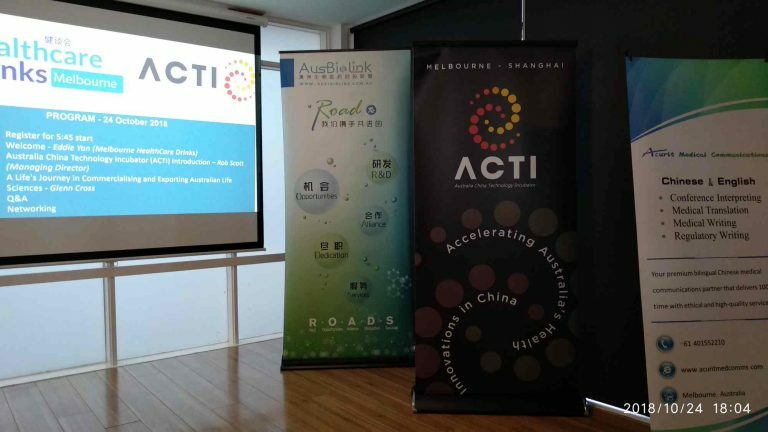 *Melbourne Healthcare Drinks and Australia China Technology Incubator (ACTI) co-organised the event on 24 October 2018. Glenn Cross is an ACTI advisor. This article is developed on the author’s on-site note-taking. Amanda Xiaoqing Mao, PhD is a B2B bilingual Chinese medical writer, interpreter and translator based in Melbourne, Australia. She is also Melbourne Healthcare Drinks pro bono co-founder. Having obtained a PhD in Biochemistry at the University of Missouri – Columbia, she worked for eight years in the medical and health industry in China. Amanda trades as Acurit Medical Communications. For more information contact her at Amanda.Mao@acuritmedcomms.com. Healthcare Drinks was started in Shanghai, China and is a networking platform for professionals in pharmaceutical, consumer health, medical device, biotech, digital health and venture capital firms. We have many chapters in Asia, Australia, North America and Europe. In Melbourne, we run medical and health talks, panel discussions and networking events connecting Australian and Chinese companies. To be informed of future events, please subscribe to our newsletter.